Healthcare data has the potential to reduce costs, enhance quality, and improve the patient experience. The challenge is how to get from information to insight to action. Tableau empowers everyone in a given healthcare organization to find the right path forward. 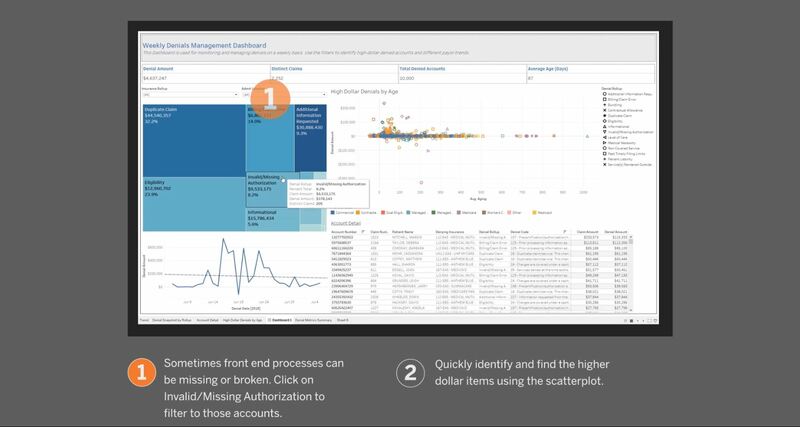 In an industry where seconds count, Tableau reduces the time it takes to connect to your data, visualize, analyze, and ultimately find answers. Join us for this this one-hour webinar, hear how Loma Linda University Health (LLUH) is leveraging interactive data visualization alongside Epic to build a data-informed partnership with providers that significantly reduces unwarranted care variation. Attend live to hear how LLUH has improved care and decreased costs by leaning on data. In 2019, healthcare analytics will continue to play a central role in driving innovation and value for providers, physicians, and patients. 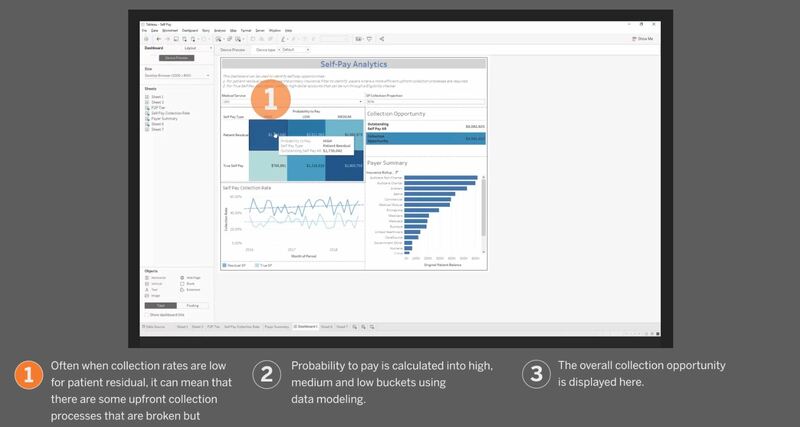 Learn how to harness the power of Tableau and visual analytics to establish a five-step data-driven process that will improve revenue cycle management in your organization. In this eBook you’ll discover why healthcare organizations are implementing integrated, self-service analytics to maximize revenue, accelerate revenue collections, minimize denials, and reduce revenue leakage. Learn how to address your critical information gaps with an integrated visual analytics platform that gives you what’s needed for RCM success. With a 360-degree view of all of your HIT systems data—from billing, to claims, to coding—your organization can achieve new levels of performance and patient satisfaction. In this on-demand webinar, you will hear how Stamford Health has leveraged visual analytics to deliver custom reports across the entire organization. See how they now quickly identify bottlenecks in their revenue cycle, recognize changes on account receivable days, spot drifts on collections rates, and detect trends in charge lags. The Fast Analytics Team, within Revenue Cycle Management at the University of Michigan Health System, set out to improve their reporting and analytics with Tableau. Over the course of their experiment, the team developed tools and processes that eliminated 8000+ annual work hours from revenue cycle metrics, charge estimation, cash reconciliation, and other areas. Michigan Medicine is home to one of the largest health care complexes in the world, with three hospitals, 40 outpatient hospitals, and more than 140 clinics. Michigan Medicine’s Fast Analytics team serves the data needs of over 30 internal groups. With Tableau, the health system was able to automate 85 - 95% of reconciliation and provide a baseline to quickly reconcile the remaining portion - which wasn't possible before. 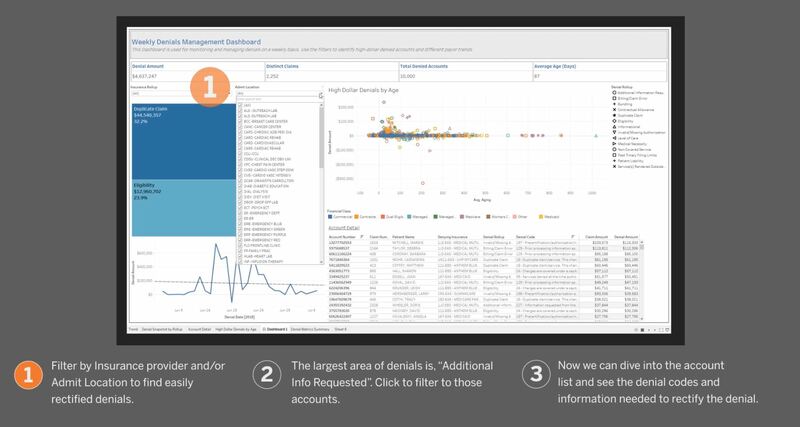 They were also able to create a charge estimate dashboard, shifting a 4.5 hour process to a 4.5 second query. While data analysis is nothing new in healthcare, the game is quickly changing. Now organizations must have sophisticated interplay between IT and finance systems that ensures close analysis of the organization's entire claims data universe. Learn about the strategies organizations are using to develop comprehensive dashboards and sophisticated trending analyses that prevent millions of dollars in claims denials and hundreds of hours of lost labor. Let's get technical. Bring IT into the discussion. Learn the 7 key areas of impact to evaluate when implementing a modern approach to BI. Intended for IT to use collaboratively with business users and analysts to assess modern analytics platforms.